I wonder what they will really use these boxes for? But the best part is the random underlining. Thanks, Joshua. 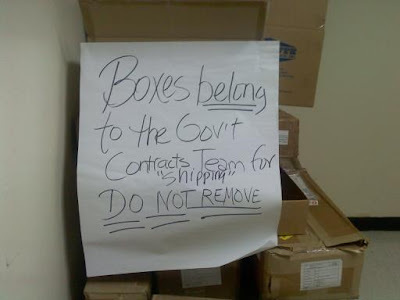 "shipping" = someone's moving and needs boxes. The way some government contacts have their cost over-runs and the corresponding fraud, perhaps they just put the $$ in them? Plus, i like how the "shipping" is just sqeezed in there like, "oh, yeah, they're for 'shipping'." Neckbeard, it doesn't count if you wrote the sign!